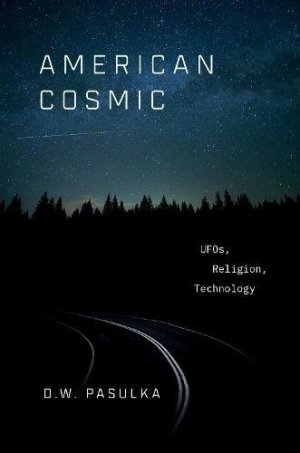 In American Cosmic, professor of religious studies D. W. Pasulka examines the rising culture around UFOs as if it were a viable new religion. Like other new religions, she says, Ufology includes scribes and prophets; a contact event and subsequent interpretations; a canon of scriptures; and holy objects. The book starts with Pasulka’s mysterious trip into the New Mexican desert near Roswell, where an alien craft was said to have crashed some seventy years ago, in search of extraterrestrial artifacts. Her companions are a well-respected scientist and a successful entrepreneur, and to them, the spot is sacred. For Pasulka, it’s the beginning point of a new religion. An enigmatic object becomes a religious artifact; beliefs are built around it. Without assessing any of the truth claims of Ufology’s practitioners, Pasulka argues that technology and media have had such an influence over the masses when it comes to the experience and interpretation of phenomena that they are slowly replacing traditional religious practice. Distinctions between what is real and what is not are blurred—especially in regard to UFOs and the existence of aliens. Coherent dialogues form around the pieces of the knowable and the unknown, of what it is presented and believed. Last chapters assert that Ufologists may not even need to understand UFO experiences within the contexts of “real” or “unreal”; their ideas may not be provable through the scientific method, and so their artifacts and experiences, and their community, are enough. These are the foundations of a new belief system—what Carl Jung called “universal mass rumor,” or living mythology. American Cosmic is a superb investigation into the birth and rise of a new religion.